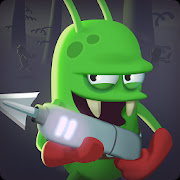 Zombie Catchers is an action adventure game in a world riddled by a zombie invasion! Planet Earth is infested with the undead, but we’re in luck: A.J. and Bud, two intergalactic businessmen, have decided to set up shop on our homeworld! Together, they plan to catch all the zombies and make Earth safe once more - while also making a handsome profit... Use an arsenal of gadgets and traps to hunt and capture ripe zombies, take them to your secret underground lab, and... profit!